Say good-bye to visible signs of ageing, wrinkles and fine lines, unwanted facial expressions lines, crow’s feet, forehead creases, frown lines and much MORE with Botox or Dysport. Anti wrinkle injections smooth away wrinkles and fine lines, unwanted facial expressions lines. A dramatic reduction in the visible signs of ageing and softening of the fine lines and wrinkle, resulting in a fresh faced, youthful appearance. More and more people are turning to cosmetic treatments to enhance and rejuvenate their face. Angela (RN), is a qualified Cosmetic Nurse, she works alongside a very reputable Plastic/Cosmetic Surgeon in Sydney. She has a special interest in cosmetic injectables since being fully trained and qualified. Angela has worked in Cosmetic Clinics for several years, advancing her training and working alongside plastic surgeons and dermatologists, performing Aesthetic medicine to the highest level. Angela, will help you to understand how anti wrinkle injection treatments will work for you. Angela Ashtari is a Cosmetic Nurse Specialist with a Bachelor of Applied Science Nursing. Angela has been rated one of the TOP 18 injectable nurses in Sydney. After 15 years in the Operating Rooms, she followed her dreams and moved into the Cosmetic Industry where she assisted Plastic Surgeons, including Dr Miroshnik with a full range of cosmetic procedures. Angela is highly skilled in anti wrinkle injections and dermal filler treatments. She's had extensive training and always keeps her knowledge at the forefront by regularly attending Conferences and Seminars to further improve her skills. Angela is a strong advocate for delivering very natural results that both beautify and rejuvenate the face. She has a keen eye for perfection and strives to provide her clients with increased confidence and a more youthful appearance. Her artistic ability, warm personality and caring nature are all part of why she has so many satisfied clients. Here are some answers to commonly asked questions you may like to know to help you understand how the anti wrinkle injections work. As we age, changes occur at different rates to our upper, mid and lower face. In the upper face, ’dynamic’ lines appear in the forehead and around the eyes when we smile or frown. These lines appear because various muscles contract to form different facial expressions. Over time, these expressions. Over time, these expression lines begin to linger a little longer or become a little deeper, even when your face is at rest (these are called ’static’ lines). 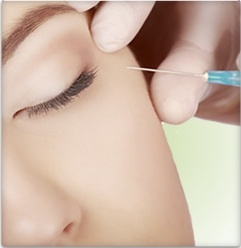 Anti wrinkle injections relaxes wrinkle causing muscles to help refresh your facial appearance. The anti wrinkle injection for the treatments is a natural, purified protein that relaxes wrinkle-causing muscles creating a refreshing look. Treatment’s active ingredients is derived from bacteria in sterile laboratory conditions in much the same way penicillin is manufactured from mold. As it is a prescription-only medicine, treatments are only available from qualified medical professionals/cosmetic physician. This particular anti wrinkle treatments relax wrinkle-causing facial muscles. These treatments are very different from dermal fillers including those that are made form naturally occurring sugar gels. These fillers are injected below the skin to fill in lines and replace or enhance facial volume in areas such as the cheeks or lips. Book in for a consultation at our injectable clinic in Mona Vale, Sydney Northern Beaches. It paralyzes the muscles in your face temporarily through its active ingredient, botulinum toxin type A. Botox can be injected into the forehead between your eyes. Botox injections for the forehead are treatments to smooth horizontal lines and vertical wrinkles between the eyes. Hyperthyroidism is the condition that occurs due to excessive production of thyroid hormone by the thyroid gland.The anti-wrinkle injections used for hyperhidrosis work by blocking the message from the brain to the sweat glands that instructs them to produce sweat. The blocking effect, while long lasting, is not permanent and your body will break down the substance after a period of time, usually 9-12 months. An 8 point facelift is a non-surgical cosmetic treatment that is designed to lift and rejuvenate eight areas of the patient's face to create a more youthful appearance. A "liquid facelift" is a nonsurgical technique that uses injectable treatments to rejuvenate the face. Treatments include injectable fillers to restore lost volume, and Botox to relax selective facial muscles. ... Some patients may want to target the entire face, creating an all-around more youthful appearance. There is no recovery time and no surgery! treatments are quick and simple, non-surgical procedures. During treatments, a small amount of anti wrinkle is injected into specific facial muscles with a very fine needle. The treatment interval is between 3-6 months, the treatment will approximately take 10 minutes. Typically any pain is minimal and brief. No anaesthetic is required, and you can resume normal activities immediately. It is imperative to follow any aftercare instructions your clinician gives you. General people start to see results within 1-2 days of their treatment and it can take from 10-14 days for full treatment effects to be visible. Regular treatments may help improve the longevity of the treatment’s effects. In addition, regular treatment may help reduce static wrinkles (those present even when your face is at rest). Angela Ashtari (RN) will discuss a treatment plan for regular treatments. Anti wrinkle is intended to enhance and refresh your looks. Treatment will only relax muscles beneath the facial lines at the point of injection, so that other elements of facial expression remain active. If you choose not to have further treatments your muscles will eventually return to normal activity and your facial lines will gradually revert to their pre-treatment levels. Angela is available every second Thursday from 10am-5:30pm, & on Fridays by request. All new clients require a 10% unrefundable deposit on booking an appointment due to high volume of no shows.